What Type of Rain Gutters Are Right for Your Home? What Type of Gutters Are Right for Your Home? Gutters Will Help You Avoid Problems WIth Your Homes Slab. Many homes are built with gutters on them, but some homes don’t have them at all. This means that when it rains, that the water will fall right off of the roof and straight down below into your yard. This may cause flooding or damage to your yard, but most importantly, it can cause you to end up having to get a slab leak repair. When water falls continuously in one spot, it can cause damage to the slab under your home. It can also make the soil so wet that over time, your slab may move. Once the soil moves, it will open up the possibility of your slab cracking and causing all sorts of issues. The beauty of gutters, is that water can be routed to a different location and in a place that will not cause problems to your slab or your yard. Gutter installation can be done by yourself or it can be done by professional. We always recommend that you have a professional do it for several reasons. One of the biggest reasons is so that you know that it is done the right way. If something ends up going wrong down the line, the professional that installed the gutters will be able to fix it under a warranty, but if you have done them yourself, you will have to figure out what is wrong or end up calling a repairman anyway. Rain gutters on your home are crucial to the upkeep and the wellness of your home. They are a great way to help keep your home working the right way and keep it safe from any damage or further damage from happening. 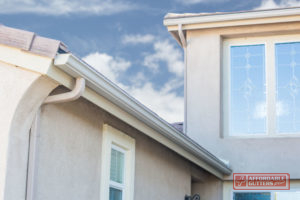 When you need a gutter repair, a professional will be able to take a good look at what the problem is and then see if it is something that can be repaired or if that section of the gutter needs to be replaced. If your gutters continue to need repairs and are getting up there in age, you may want to see about having new gutters installed. There are a lot of options that you can choose from, ranging in price from minimally expensive to much higher. The more expensive ones typically last longer and are made from more expensive materials. The great thing about rain gutters are that you can get them in almost any color so that they will blend into your home very easily. Most gutter systems will last around 20 years. If your gutters were installed when your roof was installed, it is likely that when your roof needs to be replaced, your gutters will need to be replaced as well. Some gutter systems like copper, will last a lot longer. These systems hold for around 50 years. This does make them more expensive, but typically if you install them, you don’t have to do it again. What type of gutters are best? There are a lot of great types of gutters out there and they all will get the job done, it will all just depend on preference and what you want to spend. Some of the top gutter systems are aluminum gutters, copper, steel, and vinyl gutters. Most of these can be painted to any color that you want. A great option would be to choose seamless gutters because they offer no leaks. When there are no seams, no leaks can come out. This will help the overall integrity of the gutter system and keep it lasting longer. Why rain gutters are necessary? Having rain gutters is a necessary part of your home. They will be able to direct water to a designated spot and help water from sitting on your roof as well. When there is heavy rain, it has nowhere to go but off your roof. 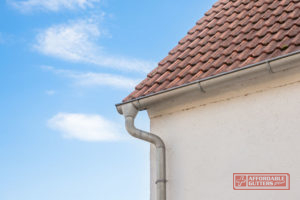 If you are wondering how rain gutters work, the gutter will work to carry the water off your roof and down through the system and off your roof. This will help prevent flooding and even problems with your home’s slab. Gutters are not unaffordable and if you are having your home built, you can always ask your builder to have them installed for you so you don’t have to worry about it later on. Some gutters can be very expensive, but that is because the material is thicker or made to last longer than other options. The most affordable option is to choose a vinyl gutter, which cost around $4 per piece. Seamless Gutters Will Keep Leaks From Happening. Rain gutters are so important on your home and should be looked into if you don’t already have them. If you need to have rain gutters installed in Canton and Roswell, GA, call our team at Affordable Gutters Plus LLC by dialing 770-735-4433. Let us help your home, today. Posted in Uncategorized on December 5, 2018 at 9:40 pm by Affordable Gutters Plus LLC. You are currently browsing the blog archives for December, 2018.